E! 's Ben Lyons and Syfy's Jael de Pardo, will host the Red Carpet for The Syfy/E! Comic-Con Party on Saturday, July 23rd at midnight ET/9 p.m. PT, from the Hotel Solamar in San Diego's famous Gaslamp District. Try out your favorite Syfy show on a plate. 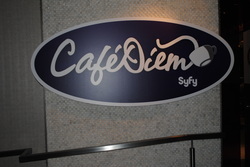 Syfy has opened Cafe Diem again this year. Located at the Hard Rock Hotel, 207 5th Ave., directly across from the San Diego Convention Center. You can choose a dish from a wide variety of Syfy's current shows. For us Fact or Faked Fans, we can enjoy Fact or Faked Wings, menu item pictured below. There is Comic Con 2011 app for iPhones only. Use foursquare to check into Syfy panels and Cafe Diem to win a prize pack! Face Off Host McKenzie Westmore and Judge Glenn Hetrick bring Face Off to Comic Con with a live challenge for contenders to win a spot on season 2. Soleil @k Restaurant, 660 K St.
NEW YORK and LOS ANGELES – July 6, 2011 – In continuing with its yearly tradition of delivering the ultimate fan experience at Comic-Con – and winding down the convention with the hottest party of the entire weekend – Syfy has unveiled its plans for participation at Comic-Con 2011. As in years past, a multitude of talent from Syfy’s hottest series will participate in interactive panels, where fans can get their burning questions answered and get all the behind-the-scenes secrets on their favorite shows! On Syfy’s docket for this year are hit Warehouse 13, Eureka, Being Human and Sanctuary, as well as new series Alphas, (premiering July 11 @ 10pm). Syfy will also hold a screening on Friday night (July 22), where fans can get an early sneak-peek of that evening’s new episode of Haven as well as the following Monday’s new episode of Eureka. Outside of the convention hall, attendees will once again get a taste of all things Syfy at the fan-favorite Café Diem, across the street from the convention center at the Hard Rock Hotel (207 5th Ave). This fictional local hot spot heavily featured in the popular series Eureka will serve up Syfy fare both on and off the menu and will remain the perfect place for fans to relax and refuel during a long day at the Con. In addition, Syfy Ventures, Syfy’s portfolio of businesses and joint ventures, and Her Universe™, a leader in female genre merchandise, will unveil the first pieces in the Syfy branded collection of apparel and accessories for the growing female science fiction fan base. Comic-Con will be the premier venue for the first launch items, including convention exclusives, starting July 20 and running through July 24. Additionally, the items will be available at both Syfy.com and Heruniverseshop.com. As previously announced, On Saturday, July 24th, Syfy will partner with entertainment powerhouse E! for its most popular Comic-Con event: the star-studded party at the Hotel Solamar in the heart of the Gaslamp district. This invite-only, exclusive soiree has cemented its place as the hottest ticket at the convention and the most talked-about party of the weekend, and this year is no different as Syfy teams up with E! to continue the tradition. E! Live from the Red Carpet: The Syfy/E! Comic Con Party will stream the festivities in real time on both E! Online and Syfy.com, with E!’s Ben Lyons and Jael de Pardo (Syfy’s Fact or Faked) as co-hosts. Small town. Big panel. Syfy’s smash hit Eureka is back at Comic-Con. Colin Ferguson (Jack Carter), Salli Richardson-Whitfield (Allison Blake), Neil Grayston (Douglas Fargo) and guest star Felicia Day (Dr. Holly Martin) join executive producers Jaime Paglia and Bruce Miller for a chat about the big secrets of America’s smartest little town. Moderated by guest star Wil Wheaton (Dr. Isaac Parrish; Wesley Crusher, Star Trek: Next Generation). Ballroom 20. For one day only, America’s top-secret treasure trove is moving from the middle of nowhere to the middle of Comic-Con. Join stars Eddie McClintock (Pete Lattimer), Joanne Kelly (Myka Bering), Saul Rubinek (Artie Nielsen), and Allison Scagliotti (Claudia Donovan) along with executive producer Jack Kenny as they take you inside Syfy’s blockbuster hit series, Warehouse 13. Moderated by Neil Grayston (Douglas Fargo, Eureka). Ballroom 20. Syfy’s newest original series Alphas has taken the summer by storm – and it’s just the beginning. Join cast members (TBA), co-creator and executive producer Zak Penn (X-Men: The Last Stand; The Avengers) and executive producer Ira Steven Behr (Star Trek: The Next Generation; The 4400) as they reveal why impossible is what Alphas do best. Alphas premieres Monday, July 11 at 10PM ET /PT and stars David Strathairn, Malik Yoba, Warren Christie, Azita Ghanizada, Ryan Cartwright and Laura Mennell. Moderated by Geoff Boucher (“Hero Complex,” The LA Times). Room 6A. Imagine Greater with fellow fans during an advanced preview screening of the next all-new episode of Eureka, followed by a special presentation of an all-new Haven. And be sure to stick around for the exclusive premiere of the all-new digital series, The Mercury Men. Room 6A. Thrilling action, revolutionary green screen sets and more bumps in the night than you can count. Catch Amanda Tapping (Helen Magnus), Robin Dunne (Will Zimmerman), and moderator Josh Gates (Destination Truth) as they take you inside Syfy’s hit series Sanctuary. Hilton Bayfront, Indigo Room. Find out why Being Human Is Harder Than It Looks – especially when you’re a vampire, werewolf or ghost. Don’t miss Sam Witwer (Aidan), Meaghan Rath (Sally), and Sam Huntington (Josh) as they join executive producers Jeremy Carver and Anna Fricke on Syfy’s first Being Human panel, moderated by award-winning writer Nadira Hira (expert on Generation Y; contributor, Fortune magazine). Hilton Bayfront, Indigo Room.